Finally, beauty boxes have arrived in Singapore! Vanity Trove has launched, and I'm so excited! For those who have been following beauty news, one of the latest trends are beauty boxes. Services such as Birchbox and Boudoir Prive are extremely popular in the the UK and US, and I have long awaited the arrival of this in Asia. If you're like me, wait no longer - Vanity Trove is in town! Following the standard beauty box format, Vanity Trove collects a subscription fee for a selection of beauty samples and products that are selected for you every month. The benefit is that you get to try a variety of products every month without having to shell out for full-sized versions. You also get the element of surprise - for a beauty junkie like me, nothing's more fun than getting a box of beauty minis and products - you don't know what's in it, but you just know you're going to like it! 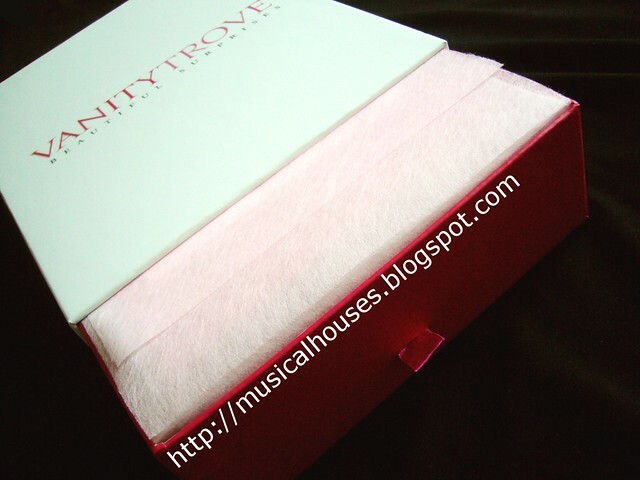 The boxes are gorgeously packaged, in a sleek white large box with a pull-out front that resembles a drawer. I daresay the packaging looks even better than the US and UK beauty boxes! Inside that pull out box, everything is wrapped beautifully in pink paper. If you have a friend who's a beauty junkie but don't exactly know what product to get her, this would also make an awesome gift, with its beautiful packaging and lovely selection of products. Once you open up the pink paper, this is what you see. Gorgeous, isn't it? Looking at the things inside just gets me all excited - there's a bunch of awesome beauty products stuffed inside this box! I'm pretty excited, because the YADAH Liptint is a ful-sized product, and so is the Leader's Clinic Face Mask (although they sell them in a box of 10). Being of an economist background (hey, I did major in Economics for my B.A., after all), I decided to do a little bit of math on how much the samples were worth vis-à-vis its $25 price tag. Altogether, the samples came up to a total value of $58! I have to say, I was impressed by this figure - it means you're definitely getting your money's worth for sure! I haven't had the time to try out all the products yet (come on, you guys don't expect me to give you full reviews of 6 products in one day, right? ), but I've reviewed other Leader's Clinic face masks before, and I've found the Leader's Clinic brand to generally be a good one. And Clinique's Moisture Surge is of course one of those tried-and-true, swear-by-it staples, so those are great additions to the box. Out of the entire box, my favourite item was the Yadah Angel Liptint, which is actually quite similar to Benetint and its many imitators. 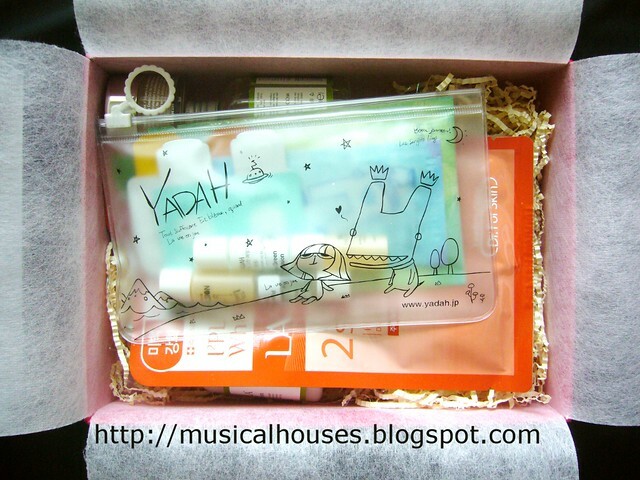 The Yadah Liptint is slightly different as it's in a gel form, which makes it easier to apply and less prone to spilling. It does seem to stay on, and if you splash water on your face it doesn't smudge, although if you eat an oily meal it will disappear. And it smells like candy! Yum! If you're looking for a beauty box to subscribe to, and if you're in Singapore or Malaysia, you can definitely check out Vanity Trove. Or if you're looking for the perfect gift for a beauty junkie or a girly-girl, this would also make a great gift. 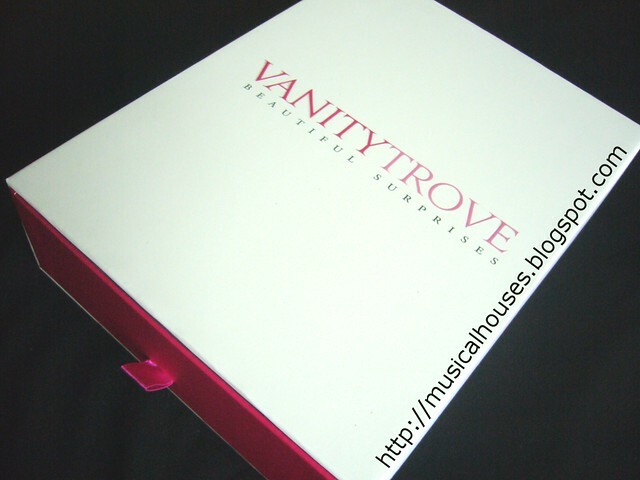 Here's a sign up link for Vanity Trove so you can place your order, or just learn more about Vanity Trove. Gosh the packaging is so pretty! Love trying out new products :) Thanks for sharing! Okay so...I want that little pouch.I can't wait to hear how the moisture surge works out for you; I recently posted a review on it!